We visited “Takegawara Onsen” in Motomachi, Beppu, Ōita. This public bathhouse has been reputed as a symbolic onsen in Beppu. 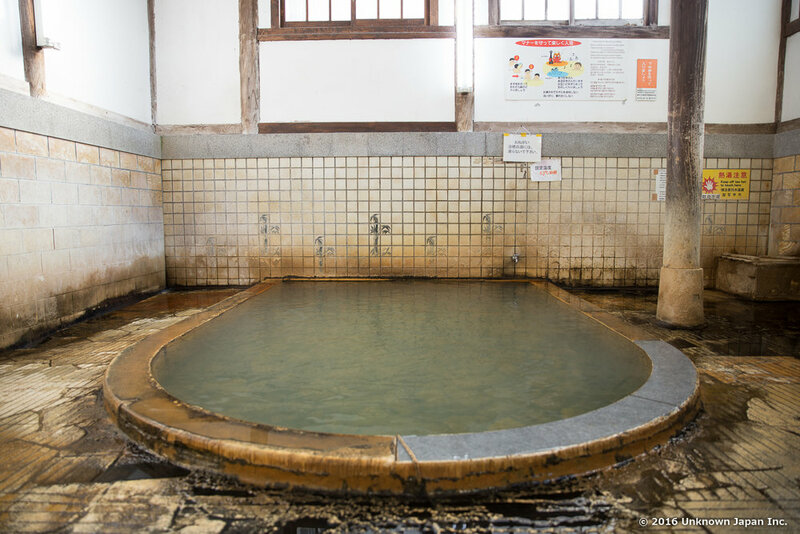 According to a reception staff member Setsuyo, Takegawara (竹瓦 in Japanese) Onsen originally opened in 1879, at that time the roof was made with bamboo (竹 in Japanese) and thatch, and the roof was changed to Japanese tiles (瓦 in Japanese) when it was renovated in 1938. That is how Takegawara (竹瓦 = 竹 + 瓦) is named. Setsuyo kindly welcomed us at the reception. This is the inside. It is very open with high ceiling. And the interior and floor are nicely aged. The locker room is retro as well, but is well maintained. The bathroom is also nicely aged. There is a big bathtub. Like other hot springs in Beppu, the bath temperature is hot for first-time visitors. According to Setsuyo, the temperature is set to 45°C|113°F in the weekday morning for daily local visitors, and it is cooled down by adding cold water in the weekend morning for tourists. This is the hot spring source, it is really hot! This is the sand bath. There are two sections, and one section is for eight people at a time. Recently, the sand bath has been popular for foreign visitors, and everyone enjoys sand-bathing. As the bath promotes blood circulation, it can treat foot pain. She is a reception staff member Setsuyo. She always tries to have a polite communication with every visitor. As many tourists come from across the world including Japan and various countries, a subtle difference can result in a miscommunication due to the cultural difference, so she always cares about what she says. Also, she is now learning English to be able to have a good communication with foreign visitors. As the number of foreign tourists who visit Beppu is increasing, the people working in Beppu are making effort to provide a good service to the visitors.